Honor Roll Member – Watkins, Maxine Theodora (Sherrard) « Perry High School Alumni Association, Inc.
Maxine Theodora Sherrard was born in Perry, Oklahoma on June 3, 1920 as a twin to Marian Sherrard, and big sister, Marciel Sherrard. Maxine’s parents were David Theodore (Ted or D.T.) Sherrard and Angeline Sherrard. Theodore was the Perry Postal Carrier for the entirety of his work career. Angeline passed away when the girls were young, probably in about 1931-1935 at Perry. Theodore passed away in about 1974, at Oklahoma City. Marian passed away in Duncan, Oklahoma in the mid- 1980’s and Marciel passed away December 20, 2010 at Wichita Falls, Texas. Maxine grew up in Perry, Oklahoma where she attended all levels of school from Kindergarten through graduation with her twin sister, Marian, in 1938. Marciel had graduated the previous year. Maxine stayed in Perry for another year or so and then moved to Oklahoma City to attend Secretary College where she excelled. Upon graduation, Maxine became employed at the Oklahoma State Department of Agriculture (Entomology Division). She would work in this capacity until her retirement in 1981 (41 years). Maxine married Leland James Watkins of Oklahoma City in the spring of 1950. Leland passed away in Oklahoma City in March 2008. They were married for 58 years. Maxine and Leland had two adopted sons, Bill Watkins of Lawton, Oklahoma and Fred Watkins of Idabel, Oklahoma. She has 5 grandchildren and 5 great-grandchildren. As devoted Christians, Maxine, Leland and the boys were faithful members of First Baptist Church, Oklahoma City. As avid square dancers and world travelers, Maxine and Leland enjoy their retirement years to the fullest. Maxine loved Perry and returned as often as possible (no less than once a month for 20 plus years) until her father, Theodore, moved to Oklahoma City to live with her, Leland and the boys. 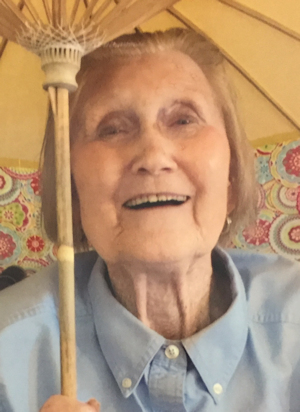 Maxine now resides in Lawton, Oklahoma at The Brentwood Senior Living Center. Outside of being wheelchair bound, she is very independent and enjoys the friends and activities that are provided daily. She especially enjoys the daily visits from family members.